I apologize in advance for being especially random in this post. I woke up in an explosion of pain and I’ve spent most of the day in bed. As I write this, my fingers and hands rebel and scream, “GET OFF THE COMPUTER! GO BACK TO BED!” I’m trying to ignore the screaming. If I didn’t have a good book to read, I would feel pretty unhappy about my little sojourn in bed. Basically, I am paying for having spent too much time on the phone yesterday AND hanging out with a someone downtown on the same day. A little too much for my fibromyalgia-ridden body. Three years now since being diagnosed, I am still learning to accept my limits or suffer the harsh consequences. I am still watching Dexter Season 3 like an obsessed maniac. One of the things I love about the show is that it is set in Miami and because of this, the cast is very diverse. The Hispanic characters, even the white characters, immersed in a place where the Cuban community is very strong all speak a little Spanglish as if Spanglish were the national language of Miami (maybe it is?). No stereotypical Hispanic maids or thick Spanish accents here, there are plenty of strong, complicated Hispanic characters on the show and it is lovely to watch. I am very excited about getting to spend Sukkot in Los Angeles again. Goodbye rainy New York Sukkot, hello, sun frying an egg on my forehead under the sukkah. October is pretty hot in LA. If you could hook up an air conditioner in a sukkah, things would be altogether perfect. I had high hopes to spend Rosh Hashanah on the Upper East Side but that fell through when I had trouble arranging meals in the area. My husband wasn’t surprised that I couldn’t coordinate things by my self-imposed deadline. He said that most people spend Rosh Hashanah with family. But we don’t have Jewish family in New York so holidays here can get very lonely. A really awesome quote I heard a fellow convert say comes to mind at times like these, “What no one ever tells you about conversion is that it’s lonely. It doesn’t matter what religion you convert to, when you don’t have family to participate and enchage the identity, living life in the faith is difficult.” The more I read this, the more I think, “Whoa.” Because this indeed has been my experience. I will right about this quote further when the pain wans. Rosh Hashanah in Riverdale would have been very lonely if my little sister hadn’t come over one night to eat with us and my neighbors hadn’t invited us out for a meal the next day. And to take another sharp turn in this post, I wanted to highlight some upcoming multicutural events at the JCC Manhattan, which incidentally is also arranging a group to visit Cuba. Parents and tweens/teens will have the chance to meet with their peers and talk about merging Jewish identities with that of other ethnic, cultural, or racial identities. Co-sponsored with the Jewish Child Care Association/Ametz Adoption Program, JBFCS, and Be’chol Lashon. Join Riki Mulu and Chassida Shmella to celebrate the Sabbath with unique Ethiopian customs. Special guest will be Dr. Ephraim Isaac, director of the Institute of Semitic Studies in Princeton, NJ. Space is limited;pre-registration required. (Friend) Ernest Adams’ personal story could not be more timely nor his analysis of race and religion in American more relevant. Ernie will discuss his story with (my former teacher) Samuel Freedman, author, professor at Columbia University’s School of Journalism, and New York Times columnist. For centuries, a central theme among the Jews of Spain was their longing for a return to the Land of Israel. This was a romantic and religious desire of many Spanish Jews – a desire that eventually became a reality. 7:30pm Keynote Address: Professor Ross Brann, Milton R. Konvitz Professor of Judeo-Islamic Studies, Cornell University, NY. Jews can trace their presence in Egypt back more than 3,000 years. In 1948 there were 80,000 Jews in Egypt; today, less than 100. Jean Naggar’s book “Sipping From the Nile: My Exodus From Egypt” is a fascinating look at a forgotten world. Naggar was born in Alexandria and grew up in Cairo in a world of wealth and sophistication that disappeared after the Suez Canal crisis of 1956. Having left at the age of 18, her childhood memories open a window into a little-known time and place. Joyce Zonana’s book “Dream Homes: From Cairo to Katrina, an Exile’s Journey “ is one of seeking memories and constructing identity. She left Cairo with her family at 18 months, following the Arab-Israeli war of 1948. This colorful film brings to life a remarkable history dating back two millennia. The filmmaker travels to Goa, Bombay, Cochin, and Calcutta the cities of the fascinating subcontinent of India where Jews have made their homes. Thanks to all the folks who keep sending me the latest Jewish news on multicultural events around the city! I wish my body would cooperate so I could attend more of them. 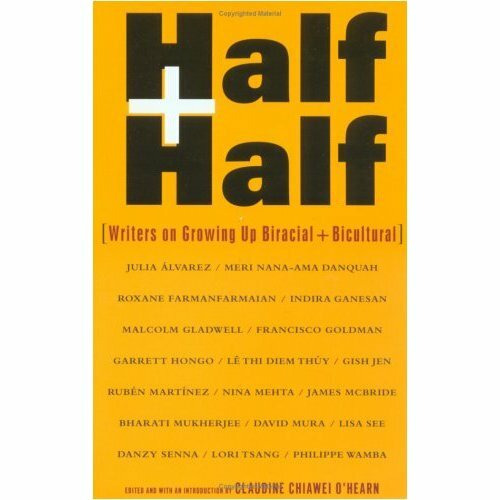 And when I’m not reading books about vampires obsessively, I’m also reading “Half and Half: Writers on Growing up Biracial and Bicultural”. I had the pleasure of discussing the book in a recent conference call with other multiracial folk organized by half-Chinese/half-white Jewess and anti-racism activist Jen Chau who runs the über cool organization Swirl, a national multi-ethnic organization that challenges society’s notions of race through community building, education, and action. Anyway, I have a list of upcoming posts that is miles long so expect me to write about things as varied as being a fashion victim, the side effects of taking too much Ambien and hopefully, if I’m daring enough to write about it feminism in the Modern Orthodox community. Previous Post Another Jewtina is born! Are you familiar with paperbackswap.com? Like you, I'm disabled, and I go through a book a day, at least. Between that, the local library, and a couple of search programs that give me free Amazon.com gift cards (lemme know if you want info on them), I can keep my book budget reasonably low.